The police had searched the house belonging to the sister of tele-actor Ryan Van Royen, who is currently in custody in Dubai together with drug kingpin Makandure Madush, yesterday due to the suspicious behaviour of the occupants. The house down Parantha Dolewatte Road, Panadura was taken on rent under Ryan’s sister’s name and his mother. Father, sister and family had been living there. However, they were preparing to leave the house and move to another location when the police who had obtained a court order to search the home had arrived. The police are suspicious of Ryan’s connections with Makandure Madush and on a previous location when his Dehiwala house was searched, the police had found a scale used to weigh drugs. The police had also obtained a statement from Ryan regarding the Rs. 5 billion worth diamond theft in Panadura. At the time the police had arrived at Ryan’s sister’s home with the search warrant, the occupants were in the process of shifting and was loading their stuff into a lorry. The police had produced the search warrant and even unloaded the stuff from the lorry and searched them. However, they had not found anything suspicious. The lorry used for the shifting was found to bear a sticker with ‘VIP’ indicated on it and the police had taken steps to remove it. 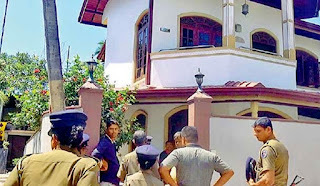 The neighbours had told the police officers that they had observed many luxury vehicles arrive at this house at night and in such instances, the lights in the house are switched off and they hold meetings on the balcony. In his statement, the house owner had told the police that he had given the house on rent to Ryan’s sister who had responded to an advertisement on the internet. Ryan’s sister, husband, their child and parents had been living at this house. The Panadura Police is conducting further investigations.